We welcome interested students and researchers to make enquiries and to join our team. Postgraduate research projects including Masters and Doctoral projects are often available, and grants/scholarships may be applicable. Publicised opportunities are listed below. These may be undertaken as Vacation Honours projects or may even be a suitable starting point for a Masters or Doctoral Thesis. Prospective students should contact one of the listed superviors on our team page and you can find more information about studying at UNSW here. The East Australian Current (EAC) is a hotspot for climate change with unprecedented multidecadal warming and freshening occurring there. Understanding the drivers of these changes in both temperature and salinity is critical to understanding the impacts of climate change on marine ecosystems and society. This project will employ new observations, climate model simulations, and cutting edge analysis tools to provide a characterization of EAC waters. The student will investigate past and future variability including extreme events and the effect on sea level, and identify the dynamical drivers and the impact on biological systems. The student requires an undergraduate degree or equivalent experience in dynamical physical oceanography, or a similar field such as atmospheric science or an equivalently numerate field such as physics, mathematics or engineering. Knowledge of statistical and dynamical analysis techniques. Technical expertise in Matlab or Python programming is highly desirable, as well as experience with Linux. The student should have a bold outlook with regard to their potential contribution to oceanography. They should have a clear vision regarding how their PhD training can propel them into diverse and evolving career areas relevant to climate change and marine research. In this project, you will work with measurements from high frequency (HF) radar along the NSW coastline to locate Lagrangian coherent structures (LCS) hidden in the ocean surface currents. The LCSs obtained from HF radar measurements provide a unique way to visualize the evolving structure of dynamic ocean features such as fronts, filaments and eddies in the Tasman Sea. These structures govern the transport pathways of particles in the ocean (such as oil, or fish larvae). You will investigate how different flow regimes affect particle dispersion at the ocean surface. This project will work with HF radar measurements of ocean current velocity, together with satellite imagery of sea surface temperature and chlorophyll-a. There will be opportunities for oceanographic field work if desired. You will need a basic knowledge of mathematics, and experience in a programming language such as Matlab or Python is desirable. 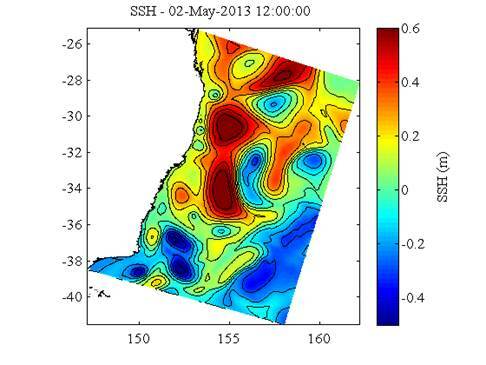 Figure 1: Ocean Currents from HF Radar in the East Australian Current; Langrangian Coherent Structure. What are the main factors driving biological variability on the continental shelf? 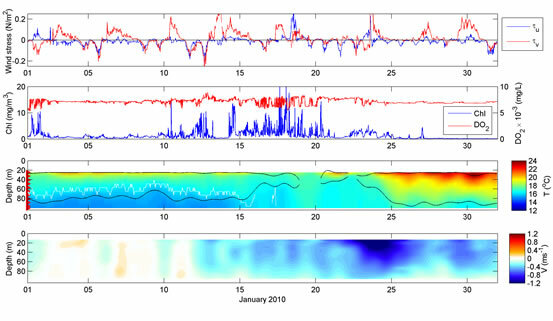 Fluorescence measurements (a proxy for chlorophyll) obtained from repeated ocean gliders deployments and oceanographic moorings on the continental shelf of Australia will be analyzed and related to the physical oceanographic conditions (temperature, salinity) and forcings (wind, current, eddy encroachment). Required skills: Some knowledge of Physical oceanography and statistics; Matlab or Python programming. Figure 1: Shows wind stress, Chlorophyll, Dissolved oxygen (20m below the surface), temperature and along shore current speed (through the water column) at the 100m isobaths off Sydney. What drives the spikes in Chlorohpyll from day 10 to day 20? Effective prediction of the eddying mesoscale ocean circulation requires a combination of numerical modelling and ocean observations. Numerical models alone are unable to predict the timing and location of eddies due to their chaotic nature, while ocean observations are sparse in time and space. Data assimilation combines observations with a numerical model such that the model better represents the observations and provides the dynamic context. To improve our ability to predict the ocean circulation, we must understand how assimilated observations affect our predictive skill. The East Australian Current (EAC) transports warm water from the tropics southward along the east coast of Australia. The current becomes unstable and forms a series of mesoscale eddies, particularly between 31-33S where it strengthens and separates from the coast before turning eastward, forming the eddy-rich Tasman Front. The EAC affects weather, climate and fisheries along Australiaï¿½s most populated coastline, but its highly dynamic nature makes its circulation difficult to predict. At UNSW, we have combined an array of ocean observations with a numerical model using data assimilation to generate an estimate of the 3-dimensional ocean state over a 2-year period in the EAC region (called the ï¿½EAC reanalysisï¿½, Kerry et al. Geoscien.Model Dev. 2016). We use the Regional Ocean Modelling System (ROMS) combined with incremental, strong-constraint, 4-dimensional variational (IS4D-Var). This advanced data assimilation technique adjusts the model initial conditions, boundary conditions and forcing for each analysis window such that the difference between the model solution and all available observations is minimised, in a least-squared sense, over the assimilation interval. Our EAC reanalysis assimilates the full suite of available oceanographic observations including both traditional observations (from satellites, floats and XBTs) and more modern oceanographic datasets (such as high-frequency radar, ocean gliders, deep (~4500m) and shallow (~100m) moorings). This is assumed to give the most accurate representation of the ocean state, however, it is recognised that many of the more ï¿½modernï¿½ data streams we used are not readily available operationally (real time) and are not available in other oceanic regions that we may be interested in predicting. In order to develop a system that can be readily applied for operational purposes in a timely manner we need to understand the cost-benefit of each observation stream. This is particularly important in regions of low observation density. The objective here is to determine the skill that can be achieved by assimilating only the more traditional observations (that are readily available across most oceanic regions), and assess the impact of including the more ï¿½modernï¿½ observations that could eventually be operationalised. The student will compare the reanalysis skill for data assimilation experiments that include; (a) The full suite of available observations, and (b) Operationally-available, ï¿½traditionalï¿½, observations only. This will provide a baseline of achievable model skill from traditional observations only and, comparison of model skill relative to the complete prediction system, will allow us to assess the relative improvement achieved by the suite of modern observations. Desired: A background in Physical Oceanography or a similar discipline. Familiarity with and interest in numerical modeling and data assimilation. Required: Skills in Matlab or other data analysis programs (such as Python). Self-motivated person able to work independently and in a team.